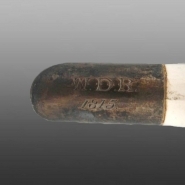 While it was common to repair the tips of broken spouts with metal replacements, this is a very rare example because the restorer added the initials "WDR" and the date, "1815". A large earthenware punch pot printed in blue in an unidentified landscape pattern and a floral border. Of interest, in addition to its size, is the use of a small pattern that is repeated six or more times in order to cover the entire body of the pot. It appears that the maker chose to use a pattern originally made for a smaller item instead of engraving a new pattern appropriately sized for this large pot. Also of interest is the dated and monogrammed metal repair to the spout (see the close-up below).